ANDREW GLIKSON. Last call on climate—evidence for a demise of the planetary life support system. The paper states: “We explore the risk that self-reinforcing feedbacks could push the Earth System toward a planetary threshold that, if crossed, could prevent stabilization of the climate at intermediate temperature rises and cause continued warming on a “Hothouse Earth” pathway even as human emissions are reduced. 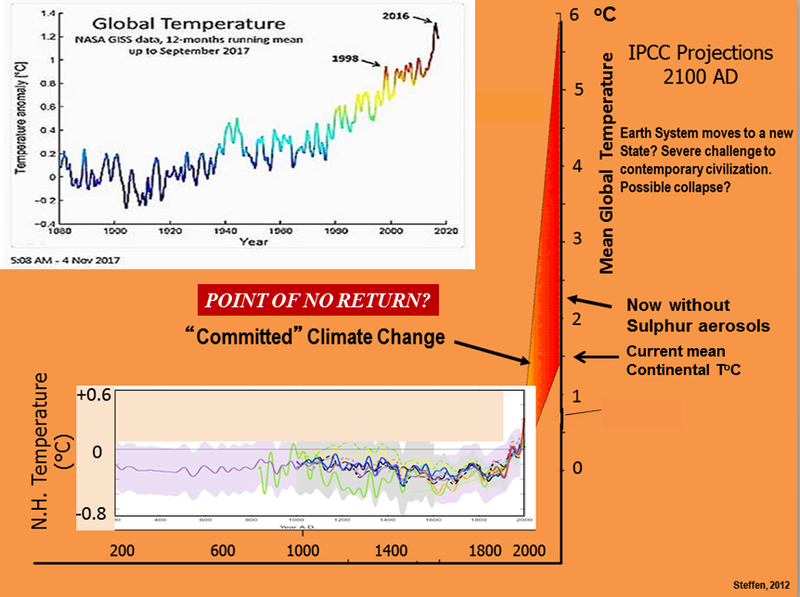 Crossing the threshold would lead to a much higher global average temperature than any interglacial in the past 1.2 million years and to sea levels significantly higher than at any time in the Holocene. We examine the evidence that such a threshold might exist and where it might be. If the threshold is crossed, the resulting trajectory would likely cause serious disruptions to ecosystems, society, and economies. Collective human action is required to steer the Earth System away from a potential threshold and stabilize it in a habitable interglacial-like state. Such action entails stewardship of the entire Earth System—biosphere, climate, and societies—and could include de-carbonization of the global economy, enhancement of biosphere carbon sinks, behavioral changes, technological innovations, new governance arrangements, and transformed social values. In addition an essential requirement for down-draw of atmospheric CO2 is needed if the other methods prove to be insufficient. “It found the Earth was heading for a tipping point, known as a “hothouse” climate, which could lead to average temperatures up to 5oC higher than pre-industrial temperatures and rises in sea level of between 10 and 60 meters. Lead researcher Professor Will Steffen from the Australian National University (ANU) said at that point much of the earth would be uninhabitable. He explained that if human emissions raised global temperatures to 2oC above pre-industrial temperatures it could trigger earth system processes, or feedbacks, that could then cause further warming. “The real concern is these tipping elements can act like a row of dominoes,” Professor Steffen said. “Once one is pushed over, it pushes Earth towards another.” Professor Steffen said global average temperatures were currently just over 1oC above pre-industrial temperatures and rising at 0.17C each decade. Current efforts ‘unlikely’ to help avoid tipping point” (http://www.abc.net.au/news/2018-08-07/climate-heading-for-tipping-point-and-risk-of-hothouse-earth/10080274). However, according to the Berkeley Earth institute (http://berkeleyearth.org/summary-of-findings/ ) global temperature rise over the continents has reached about 1.5oC. “The authors of the study examined 10 feedback processes, some of which could cause “the uncontrollable release” of carbon back into the atmosphere, after it had been stored in the earth. Some of the processes also included permafrost thaw, Amazon rainforest dieback, a reduction of northern hemisphere snow cover, a loss of Arctic summer sea ice, and a reduction of Antarctic sea ice and polar ice sheets. The study did not lay down a timeframe for when such events would begin to occur, but theorized — if the threshold was crossed — it could be within a century or two.” (http://www.abc.net.au/news/2018-08-07/climate-heading-for-tipping-point-and-risk-of-hothouse-earth/10080274). The time frame may be shorter in view of the extreme rise rate of atmospheric greenhouse gases, including CO2 and methane. These observations are consistent with those of Professor James Hansen, NASA’s former chief climate scientist, who stated (2012) “Burning all fossil fuels would create a different planet than the one that humanity knows. The palaeoclimate record and ongoing climate change make it clear that the climate system would be pushed beyond tipping points, setting in motion irreversible changes, including ice sheet disintegration with a continually adjusting shoreline, extermination of a substantial fraction of species on the planet, and increasingly devastating regional climate extremes”. These observations are also consistent with the 2010 statement by the present Prime Minister of Australia: “We are as humans conducting a massive science experiment with this planet. It’s the only planet we’ve got …. We know that the consequences of unchecked global warming would be catastrophic …. We as a human species have a deep and abiding obligation to this planet and to the generations that will come after us”, but has recently stated “the climate has always changed”, while the government is presiding over coal mining and exports amounting to more than 4 percent of global emissions. (https://www.theguardian.com/australia-news/commentisfree/2015/sep/18/malcolm-turnbulls-faustian-pact-on-climate-change-is-heartbreaking). Homo “sapiens” is at an advanced stage of destroying the habitability of planet Earth. Dr Andrew Glikson: Earth and paleo-climate scientist. One Response to ANDREW GLIKSON. Last call on climate—evidence for a demise of the planetary life support system. So I guess you could ask – ” how are we doing” – the answer just fine ” we are right on schedule”.